Check ou this video that the guys at the Global Poverty Project have come up with. It is a little fun, and provokes some thought. What is clear from this video is that there is a lot of other great stuff happening all over the place already. This is not about one initiative standing out above another, but together all of these efforts can make a difference, just as together our tiny voices can be heard. What do you think: Do your actions really count? 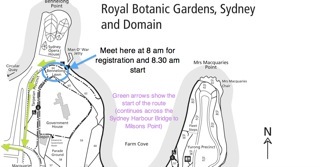 Come and join us for the global launch of the 10 City Bridge Run tomorrow meeting at 8 am just behind the Sydney Opera House for a 2.4 km run/walk across the bridge to Milsons Point. Maybe we might fall short of the 100 people, but that is not the point. Much like the Millennium Development Goals, there is still a lot of work to do. How can we improve and achieve what is the desired standard (of 100 people together running 2.4 km) before the G20 Summit begins in Seoul? We do have a good crowd running. Come and join us. Be present at the start of this journey. This entry was posted in Awareness, Extreme poverty, Marketing and tagged Global Poverty Project, Millennium Development Goals, Sydney Opera House.